Researchers from the Graphene Flagship have developed a new graphene-based device able to record brain activity in high resolution while maintaining excellent signal to noise ratio (SNR). Based on graphene field-effect transistors, the flexible devices have to potential to open up new possibilities for the development of functional implants and interfaces. Neural activity is detected through the electric fields generated when neurons fire. These fields are highly localized, so having ultra-small measuring devices that can be densely packed is important for accurate brain readings. 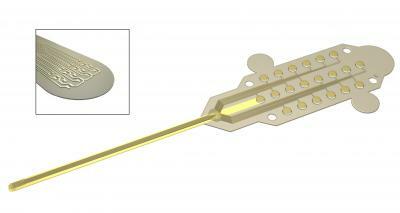 The graphene-based probes are reportedly competitive with state-of-the-art platinum electrode arrays and have the benefits of intrinsic signal amplification and a better signal-to-noise performance when scaled down to very small sizes. This will allow for more densely packed and higher resolution probes, vital for precision mapping of brain activity. The inherent amplification property of the transistor also removes the need for a pre-amplification close to the probe – a requirement for metal electrodes. The neural probes are placed directly on the surface of the brain, so safety is critically important. “Graphene is one of the few materials that allows recording in a transistor configuration and simultaneously complies with all other requirements for neural probes such as flexibility, biocompability and chemical stability.” said the team. Importantly, the researchers determined that the graphene-based probes are non-toxic, and did not induce any significant inflammation. The research was the result of a collaborative effort involving Flagship partners Technical University of Munich (TU Munich; Germany), Institut d'Investigacions Biomèdiques August Pi i Sunyer (IDIBAPS; Spain), Spanish National Research Council (CSIC; Spain), The Biomedical Research Networking Center in Bioengineering, Biomaterials and Nanomedicine (CIBER-BBN; Spain) and the Catalan Institute of Nanoscience and Nanotechnology (ICN2; Spain).